At the Franklin county Diamond Jubilee at Hampton Sunday afternoon, Oney Fred Sweet, feature writer of the Chicago Tribune and a former Franklin county boy, greeted the folks back home. He spoke at Mott field, not more than a stone's throw from his birthplace. Photo top left, L-R: I.C. McCord, A.F. Lultensmeyer, S.M. Kline, C.H. Haney, Oney F. Sweet and Jack Nortan. 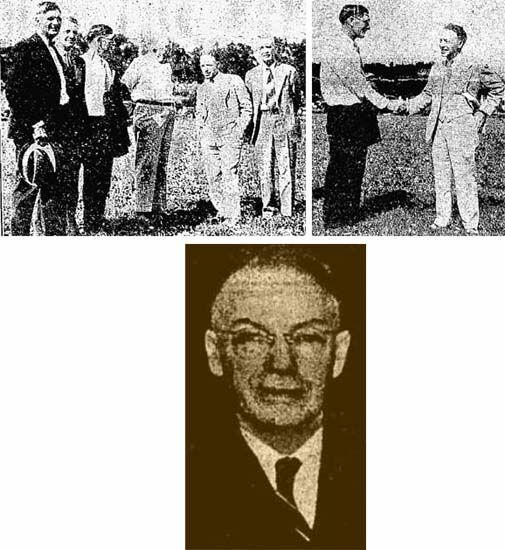 Photo top right: Oney F. Sweet (R), shaking hands with his old classmate and chum, S.M. Kline (L). Oney Fred Sweet, 65, suburban reporter for the West Metropolitan section since the neighborhood news sections were launched 20 years ago, will retire tomorrow after a career of 45 years as a reporter, 35 of them on the Tribune. Tho his career included many big events, lots of "I knew him when " opportunities, the start of the movie industry, and syndicated features him-nationally known, he leaves his typewriter believing that neighborhood news reporting is, the most interesting. This conviction rests upon the belief that the neighborhood news is "more fundamental" and offers greater opportunity for knowing people. Sweet's first assignments when he came to the Tribune in 1912 were for the Sunday room and included the Essanay Film studios on Argyle st. where Francis X. Bushman was the star and Edna Mayo and Ruth Stonehouse were the leading ladies. A Sunday series on the other fellow's job and became so well known that Sweet lectured on the Redpath Chautauqua circuit for several years, giving his "In Other Men's Shoes" talk 1,500 times. The story series included experiences as an Iowa stockman who rode a cattle train to the yards, spent the day tramping about the cattle pens, and then went to the loop to see the sights. The stock yards clothes proved a handicap In looking for a table at a good restaurant but he finally found himself at a far corner at Rector's. An incident in one of the stories was recalled 30 years later by Capt. Eddie Rickenbacker in his book on his life. Sweet had been assigned to Rickenbacker's pit at the Old Speedway track, now the site of Hines hospital. A mechanical failure forced Rickenbacker from the race. The story commented that Rickenbacker was the only one in the pit able to smile in defeat. Rickenbacker said in his book that Sweet's praise of the ability to "take it " was made a part of his philosophy of living. Sent to cover activities of the 1st infantry, Illinois National Guard, during the border incident in 1916, Sweet decided that with so many others in uniform he should be there too. With the coming of World War I he enlisted in the tank corps. His discharge is signed by Eisenhower. Quite by accident he became one of the first persons to plug for mail on a radio program. In the early, rather loosely run days of radio he was put on W-G-N to talk for 15 minutes. Without time to prepare a "current events" broadcast he made some comments on happenings of the day and hoped to fill in the rest of the time by reciting a sentimental poem. Still needing some thing to fill in he used the rest of the broadcast time with an on-the-spot plan to`tell listeners they could have a copy of the poem by writing to the station. There were 800 requests. The station staff was not too pleased with the first task of preparing printed matter to distribute to listeners. Sweet's first job in the newspaper business was with the Hampton Chronicle (Hampton, Ia.) in 1902 where he worked five weeks without pay to prove he would be worth the $4 a week salary. The Sweet home is in Hollywood, Cook county, and the family has resided in the west suburbs since 1912. Mr. and Mrs. Sweet have made no definite plans except to take their young grandson fishing this summer. The bottom photo accompanied the Chicago Tribune article. Oney Fred Sweet, whose 35 year career as a Tribune reporter ends tomorrow with his retirement. He has been west suburban reporter for the west Metropolitan section since its inception 20 years ago.